Guang Zhou Teng Xiang Packing-Products Co., Ltd. is established in 2005. Our company not only has experienced research and development team , but also has high standard automation equipment as well as 100% full inspection process of our products. Now we has over 10 years of experience with case and box including watch winder case, Jewelry case & box, cigarette case and watch case & box, etc. Our OLYMBROS products are built to the highest quality standards and our company always insist on the principle of customer first. 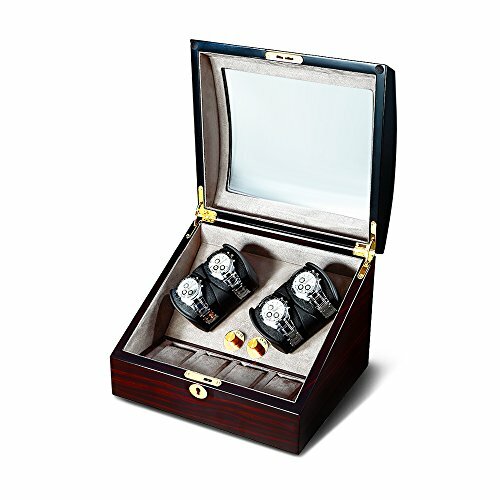 It is a fashionable wooden 2 rotors watch winder for 4 watches and storage additional 4 watches on the bottom of the 2 rotors. It is make of high quality material and use Japanese Mabuchi motor for the rotor which is quiet. It is fit for who love to collect watches and who sell watches so on. Outstanding Workmanship: The exterior is constructed of fine natural hard wood, hand-polished to a high gloss mirror finish and covers 7 key manufacturing process for long lasting durability and beauty. Interior is made of top quality velvet, handcrafted to the finest details. Extremely Quiet Motor&Excellent Customer Service: Japanese mabuchi motor, is extremely quiet and long lasting, running with no noise;1 year warranty, and lifetime technical support. We are always standing behind our products to satisfy your need. Dual power supply：AC/DC Adapter（100-240V）and D size battery (batteries not included ) ;Additional extra functions: LED Blue light can be bright the whole watch case. If you have any questions about this product by Olymbros, contact us by completing and submitting the form below. If you are looking for a specif part number, please include it with your message.